A wheel spider is primarily found in the Namib Desert in southern Africa. It is also referred to as the dancing white lady spider or golden wheel spider. The wheel spider avoids predators by digging itself deep into the sand or by scrunching itself into a ball and rolling down sand dunes at incredible speeds. The wheel spider is prey to the parasitic pompilid wasp, which is its primary predator. One can usually find spiders in areas that contain bountiful vegetation or other structures that the spiders can use to spin their webs to capture prey. Conversely, the wheel spider is one of 400,000 species of spider that do not spin webs. This is because, due to being nocturnal hunters (meaning they hunt at night), they stalk and attack their prey and inject them with venom. Fortunately for humans, the venom of the wheel spider is not considered a threat to us. In terms of size, wheel spiders are typically three quarters of an inch (20 mm) in length. They have the nickname the “white lady spider” due to their color. 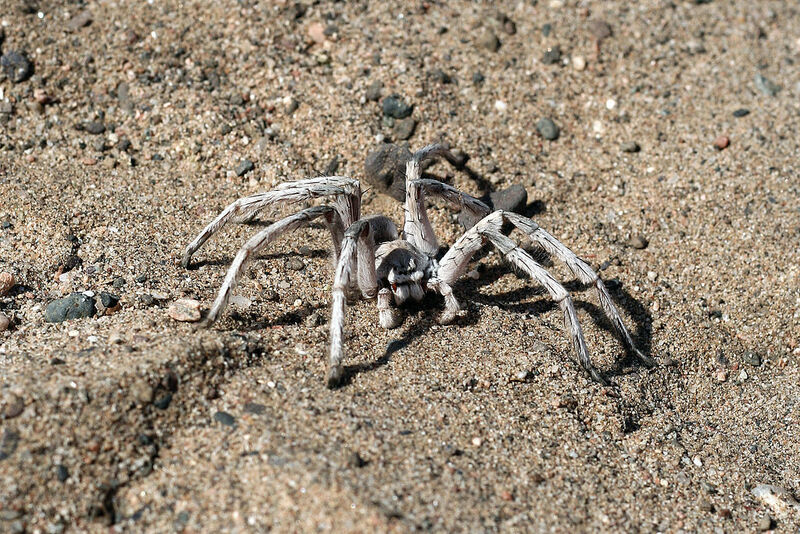 The spider has a unique, pale white color that affords it the ability to camouflage itself against the sand dunes. Its species name is officially known as carparachne aureoflava, making it part of the family of huntsman spiders, and they are sometimes referred to as crab spiders due to the way they look. The wheel spider typically spends its day resting and hiding from predators by burrowing deep beneath the sand and remaining there for extended periods of time. The burrow can be as deep as 15 inches (40 cm) below the surface of the desert sand. In the process of digging the burrow, the spider can lift an incredible 80,000 times its own body weight during the excavation. You might be wondering, how did this spider get the name “wheel spider”? The name is actually quite fitting once you learn that it bunches itself into a ball and rolls down the sand dunes to escape predators. The wheel spider can reach speeds of up to 44 rotations per second, making it fast enough to outrun its mortal enemy, the wasp. Once it stops rolling, it immediately burrows itself into the sand to further increase its chances of survival. The top predator of the wheel spider is the parasitic pompilid wasp, colloquially known as the spider wasp. The pompilid wasp is a lone wasp that hunts spiders and feeds them to their larvae, essentially making them a feast for its babies. Once stung by the wasp’s stinger, the spider is left paralyzed, rendering it incapable of escape as it is dragged into a discreet location where a nest is established (if it hasn’t been built yet, the wasp will build it then). Then, the wasp will lay an egg on the spider’s abdomen, whereby it will eventually hatch and feed on the spider. Eventually, the spider will get consumed, and a new wasp will have emerged.